Walking with Jesus: Day 113: Luke 7:1-17 & Psalm 113 - Does Jesus Bless Those Who Think Highly of Themselves? Day 113: Luke 7:1-17 & Psalm 113 - Does Jesus Bless Those Who Think Highly of Themselves? Does Jesus Bless Those Who Think Highly of Themselves? The question in today's title is absurd. It seems too obvious, doesn't it? Over and over again, the Bible warns us not to think too highly of ourselves and says how God opposes the proud but gives grace to the humble. James 4:6 and 1 Peter 5:5 both quote Proverbs 3:34 as saying, “God opposes the proud, but gives grace to the humble.” So, God gives us this Proverb three times in His word. Beyond this three-time repeated proverb, the Bible tells us . . So, does God bless those who think highly of themselves? No! It would seem like this principle is so plainly evident in Scripture as to be undeniable. But as we have seen recently again, people continue to deny this basic Bible truth. Thirty-four years ago, it was Robert Schuller who released Self-Esteem: The New Reformation. 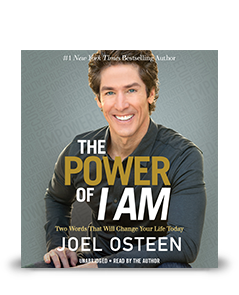 Today, it is Joel Osteen's latest book, The Power of I Am. Here's how the publisher describes this book: "In the pages of his new book, bestselling author Joel Osteen shares a profound principle based on a simple truth. Whatever follows the words I am will always come looking for you. So, when you go through the day saying: I am blessed...blessings pursue you. I am talented;...talent follows you. I am healthy;...health heads your way. I am strong;...strength tracks you down." 1. In Jesus' parable of the Pharisee and the tax collector. the Pharisee makes the self-affirming "I am" statements, while the tax collector beats his breast and says, "‘God, be merciful to me, a sinner!’ Jesus said that the tax collector went home justified and not the Pharisee. So, in these three examples, the "I am " statements of those saved and blessed by God are "I am not worthy," "I am a sinner" and "I am the foremost of sinners." Those seem a little different from the suggested "I am" statements from Mr. Osteen. We praise You, O Lord! and praise Your holy name! may Your name to be praised by every tribe and in every tongue! and Your glory above the heavens!